Words from a Bear examines the enigmatic life and mind of Pulitzer Prize-winning author, Navarro Scott Momaday. This profile delves into the psyche behind one of Native America’s most celebrated authors of poetry and prose. 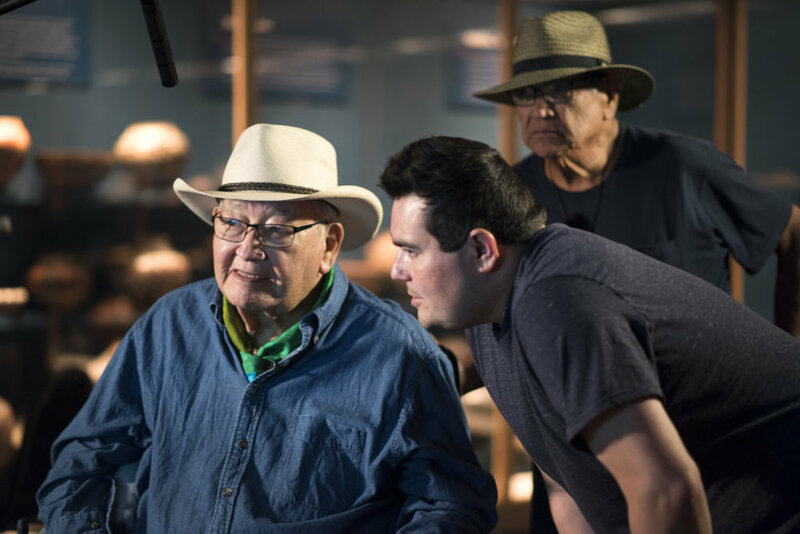 Words from a Bear visually captures the essence of Momaday’s writings, relating each written line to his unique American experience representing ancestry, place, and oral history. Cinematically this story takes audiences on a spiritual journey through the expansive landscapes of the West, when Momaday’s Kiowa ancestry roamed the Great Plains with herds of buffalo, to the sand-painted valleys of Jemez Pueblo, New Mexico where his imagination ripened and he showed superior writing skills as a young mission student. The biography will give a thorough survey of Momaday’s most prolific years as a doctorate fellow at Stanford University, his achievement of the Pulitzer Prize for Literature in 1969, and his later works that solidified his place as the founding member of the “Native American Renaissance” in art and literature, influencing a generation of Native American artists, scholars, and political activists.